"The Day Dad Was Cool!" I've taken my son Clayton on several tag-along hunts for rabbits, turkey, and doves since he was a little guy, and he's always begged me to take him deer hunting. 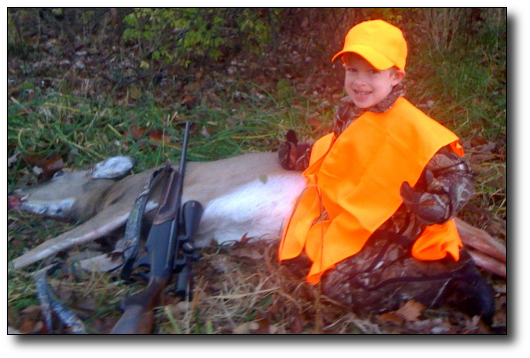 The last few years he's just been far too small, as Dad takes deer hunting very seriously for toting around a dependent, let alone the fear of having a child in the woods with lots of other hunters with high powered rifles. (One of my two main reasons for joining HSP, I'm able to have farms to myself for safety reasons, and able to take my kids hunting and fishing on quality private property.) This year I managed to fill my buck tag early in Cooper County, THANKS ANGIE & the HSP Team, so I could take my time doe hunting. This gave me a real opportunity to take Clayton out to witness his first real deer hunt, now that he's a little bigger. I fully expected not to see a single deer, or any other animals since sitting still and being quiet is a feat at home let alone outdoors! Boy was I wrong! I chose a farm close to home to minimize drive time. It was a farm that from the harvest reports, seemed unfavorable, and over-looked, from what I could tell. I just wanted to sit in a field and watch the woods for some father-son time. I had walked this farm one other time and kind of had a choke point picked out, that the deer might travel getting to bedding. Remember, no stand, just sitting in the grassy field looking at the woods, and enjoying a sunrise together. No big deal if we didn't see any deer, just being in cammo and hunter orange and leaving the house in the dark was neat for Clayton. 5:45 A.M. found us still walking, slowly, making noise, and shining flashlights randomly in the air looking for the best spot. 6AM came and we were still working out the seating arrangement details behind nature's own Foxtail grass blind. By 6:15 Clayton was sound asleep on my Scentlock coat next to me in the grass snoring out loud to my dismay. Anyone that has every hunted with a child knows the pains I was dealing with at this point. We were loud getting in, out in the open, and now we had a steady snore to ATTRACT wildlife to our ambush site, so far so good! 6:30 A.M. came and to my amazement a single doe walked out of the choke point I had scouted earlier, about 75 yards in front of me. Wow, Thank You, Lord! Now a quandary, wake Clayton or take the shot? "TAKE THE SHOT OF COURSE," but wait, doe #2, doe #3, doe #4, boy was Clayton missing it. At the first shot tragedy struck! I MISSED! You talk about a shook-up dad. Shot 2 was the exact same deal. I couldn't believe it! Then I realized I had dropped my gun the weekend prior, after I shot the buck, and my scope must be off. Hunt over. No deer. Clay missed the whole thing. Disappointed Dad! CRAP! Shot #2 had roused Clayton from slumber and he stood up with his hat on crooked and said out loud and big voiced, "What Are You Shooting at DAD?" Enter white tails, exit deer! Anyone that has ever hunted deer knows if you shoot, "sometimes" they don't run off. But if you talk out loud they are generally GONE! They just stood there. I still had 3 does in front of me, and soon I had doe #5, #6, & #7- they just kept coming out of the woods. So with Clayton wide awake, and 2 shots still left in my gun, I tried my luck again on the biggest doe. I made sure and waited until she was literally on top of us. I aimed dead center mass. No fancy stuff. I had to put one down so this boy could tell his friends we got one. When the smoke cleared she was down, Clayton yelled, "You Got One Dad!" As you'd expect all the other deer ran off -- RIGHT? NOPE, they hung out like it was a picnic! Then it happened, a buck walked out of the woods. 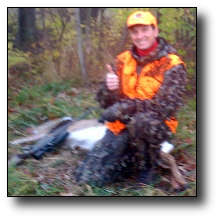 Not a big buck, just a fork horn but to Clayton he was a giant, and it dawned on me that God himself had come hunting with us because this couldn't be happening. For 15 minutes we had those deer all around us. The does' were eating. The buck made a scrape, then a rub. All walking around the dead doe, and looking up at the two orange people ornaments. Giddy over the morning events and chatting it up in the grass on the hill. What a story! I realize it would never have happened on public ground. So for the opportunity to share moments like that with my son, Thank You Very Much HSP! Work to Live, Live to Hunt.